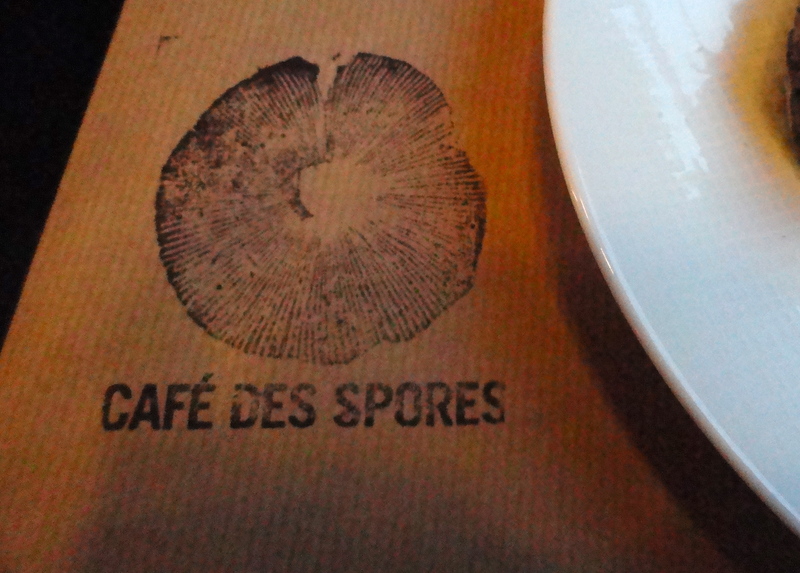 Last week my best friend and I discovered a little gem in Saint Gilles called Cafe des Spores. It’s a restaurant specialising completely in mushrooms. We thought it sounded quirky, as well as brilliant – we are both mushroom lovers. But we didn’t expect it to be exquisite gourmet food. The meal began with three little dishes: truffle soup, fried mushroom dumplings and stuffed champignons. The truffle soup was delicious, and as expected with truffle, the smell was divine. 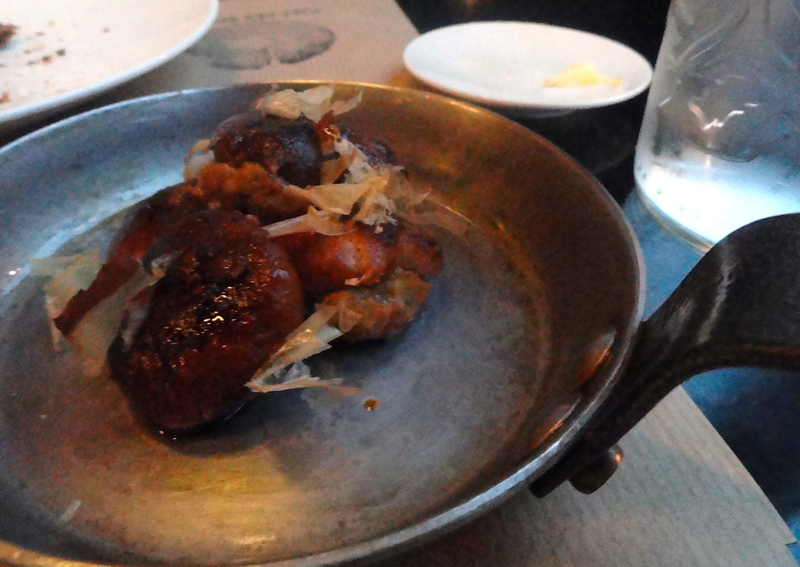 The dumplings were nice, but probably my least favourite part of the meal – indeed tasty, but rather simple. However, the stuffed champignons were spectacular, on many levels. First of all, they arrived sprinkled in some sort of dried fish flakes, which fluttered like butterflies in the heat for several minutes. Marianne and I were so freaked out about it that we had to ask the waitress if part of the food was alive. She just giggled at us. Having overcome our fear, we dug in and were shocked by the taste explosion. Tangy ginger, umami-fishy flakes, rich meaty stuffing and mellow mushroom mixing wildly. Perhaps that sounds weird, and it was, but it was also absolutely delicious. 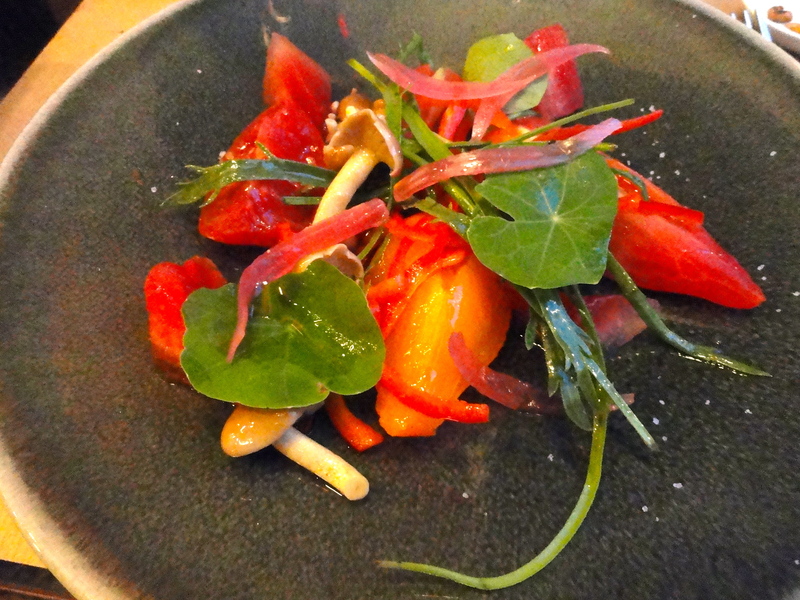 For starters we had a salad of watermelon, tomato and mushroom (pictured at the top of the post). It was very refreshing as the sweet and sour flavours came together with the dense mushrooms rather unexpectedly. But it was very tasteful, and we scooped everything off the plate rather quickly. We also has mushroom gnocchi, which was mellow and autumnal, tasting of porcini (although, as can be seen from the picture, it was some other sort of mushroom – I’d never tried it before). 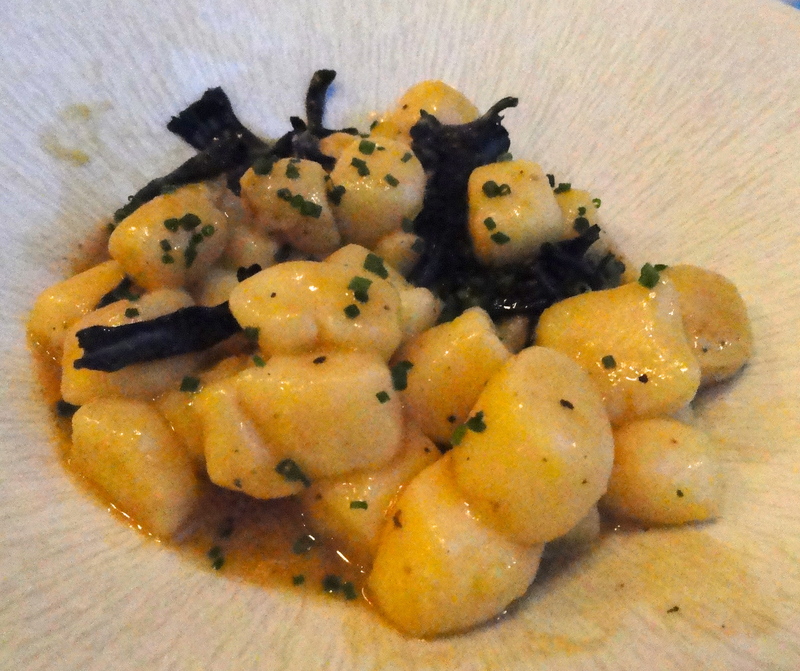 It wasn’t as sensational as the salad, and the gnocchi were a bit too soft, but it was still nice. For mains there were two choices: duck with girolles and a salmon dish. As salmon is more staple than chicken in Sweden, we both opted for the duck, especially as it was accompanied by our favourite mushroom. 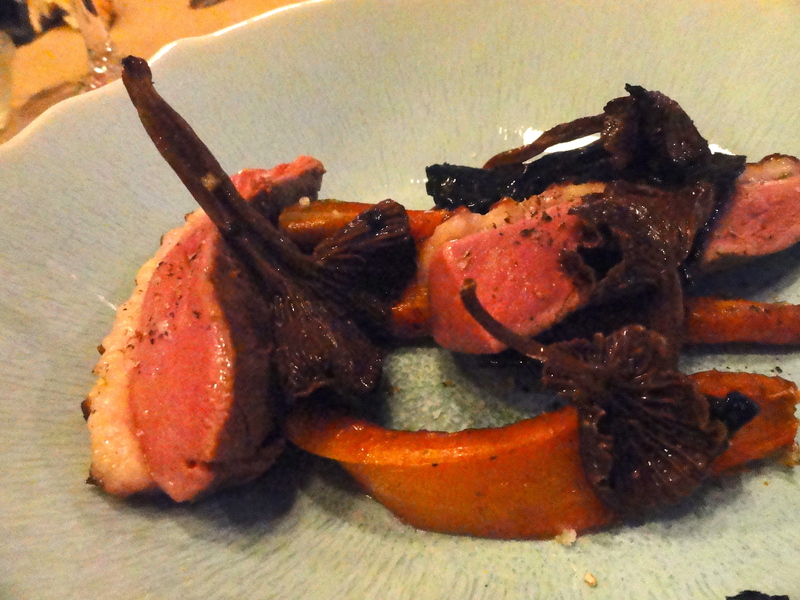 The duck was perfectly pink inside, and the girolles packed with flavour. While it looks like a rather small main, it was just the perfect size at this point. Since none of us are dessert people, we opted for the cheese with cherries instead of mushroom-infused sweet stuff (which would perhaps be the most intriguing part of the menu). 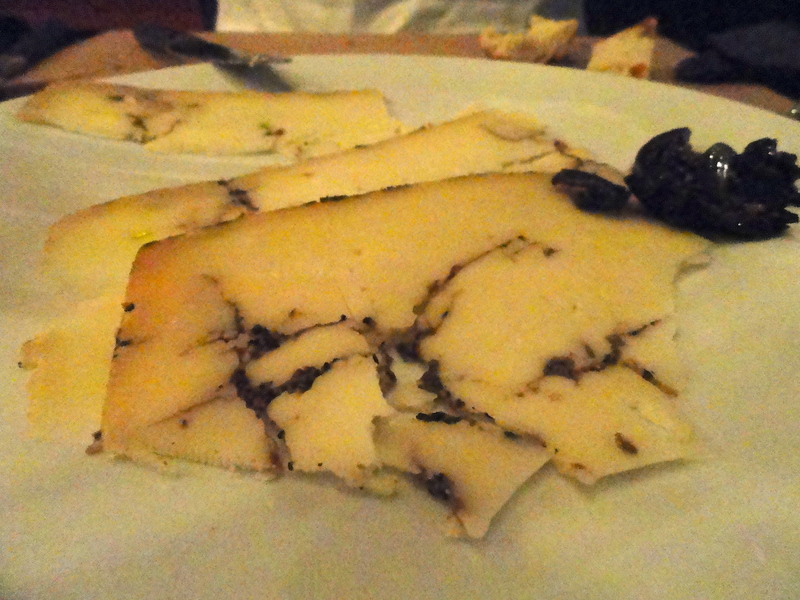 The truffle pecorino was very strong, and tangy to the point where it almost hurt our mouths. It was again something of a taste sensation, and a perfect finish to the meal. 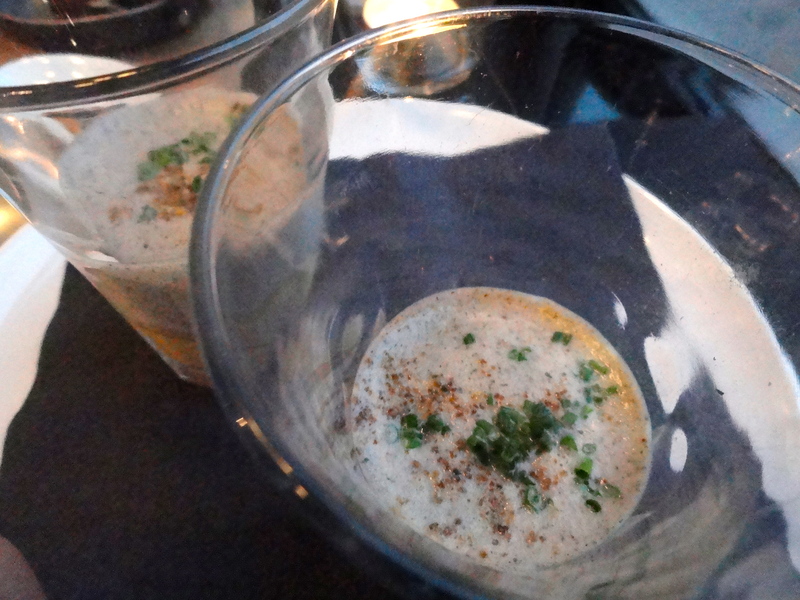 These unexpected taste trips coupled with high-quality house wine, friendly service and nice atmosphere meant it was a lovely food experience, perhaps the best I’ve had in Brussels so far. The bill, which came at 71 euros, felt perfectly reasonable given the high quality of the food. I will definitely be going here again. Nine meatballs out of ten.